Service Automation is the concept of designing and delivering automated services to end-customers. Due to technological advancements and the way that end users have changed their behavior, interest in service automation has greatly grown in the last decade. Services such as transportation (Uber), hotel reservations (Booking.com) and insurance (Geico.com) can now be delivered to customers without any human intervention, e.g. the process is completely automated. Background – What is Service Automation? The core objective of service automation is to transition analog (or manual) steps of the service delivery process into automated steps. By making this transition, service providers are able to deliver their services instantly, cost-effectively and to a potentially bigger market. Taking the steps towards the delivery of automated services is however not straightforward. Many organizations struggle with the question which services to automate or where to start. The Service Automation Framework was developed in 2016 by a consortium of service management experts to provide an answer to this question. 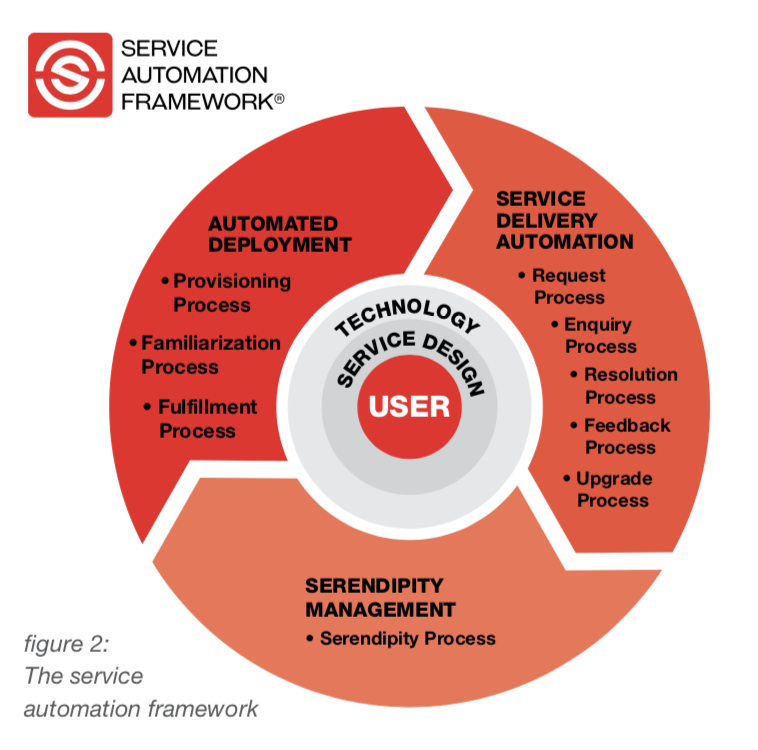 As can be inferred from the model in figure 1, the Service Automation Framework consists of six distinct building blocks that need to be considered for the design and delivery of automated services. For an in-depth discussion of each of the building blocks, we refer to the official Service Automation Framework book.1 However, it is important to remember that all services in the Service Automation Framework are designed from the perspective of the User. One of the most fundamental differences between ‘traditional’ and ‘automated’ services is that – in the latter – there is no human contact or interaction. With automated services, there is no one to talk to in case of queries, nor is there any person that explains how the service should be requested. For that reason, it is of fundamental importance that automated services are designed from the perspective of the user, and that the design of automated services is user centric. In the case of the local government as service provider, this means that services need to be designed from a ‘citizen’ point of view. The first purpose is to represent and involve citizens in determining specific local public needs and how these local needs can be met. The second purpose is the administrative purposes of supplying goods and services. Clearly, in the rest of this article, we will focus our attention on the way in which the Service Automation Framework can assist local governments to execute this second objective. Service Automation can help to make service delivery to citizens better, faster and cheaper. The role of a local government as a service provider is not something new and many publications already exists that explain the ‘digital transformation’ of government, the benefits of ‘E-Government’ or even the concept of the ‘Government-as-a Platform’ (referred to as GaaP). Many policy makers, if not all, will agree that the benefits of delivering government services are plentiful. Online platforms are easily accessible, fully auditable and, above all else, open 24×7 for any immediate assistance. 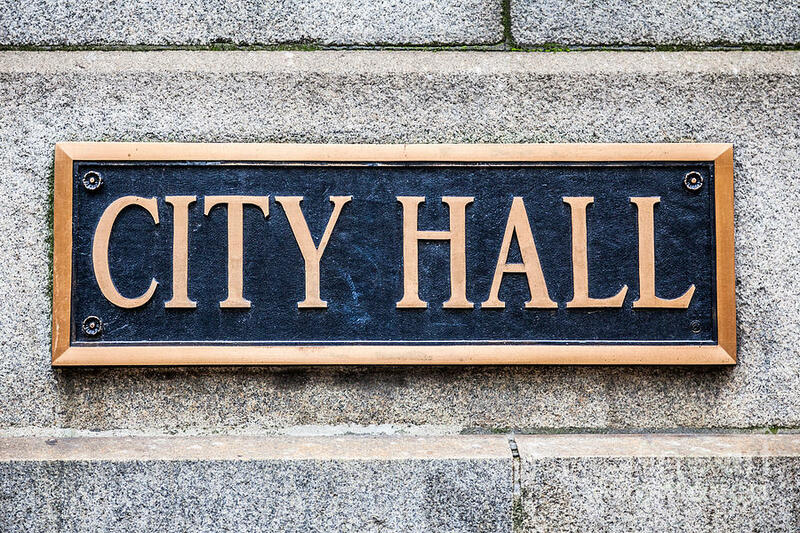 The business case to extend a digitized service delivery model to local governments is easily made, and in many local governments this topic is already on the agenda. We have found, however, that although many government leaders advocate for increased automation in the delivery of local government services, very little guidance is available that explains how this could be done. With the Service Automation Framework, we aim to provide local governments with a practical approach towards delivering automated services, as well as some tools (like service automation blueprinting) that can be used design and deliver automated services. 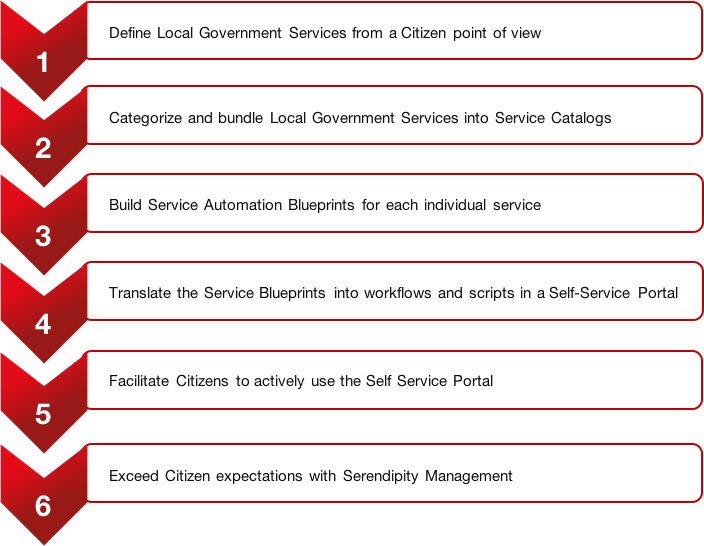 The approach outlined below has been built from a number of service automation projects in local government organizations. It includes experience and lessons learned from projects in mature markets such as The Netherlands and Singapore, as well as from more developing countries such as India and Malaysia. We found that, although individual services vary greatly per country, the process towards service automation is generally consistent. Please note that – because of the scope of a white paper – we have deliberately chosen not to dive into the subject of local data-privacy and data exchange regulations. Although these are very important and need to be taken into consideration when designing any type of platform, the scope of this subject is too complex to cover in these pages. Merely, we have chosen to focus on the practical steps that are required to automate local government services, and we have illustrated these steps with relevant examples. Each of the six steps outlined above are illustrated with some more specific examples in the paragraphs below. From our experience, each of these steps in equally important in order to successfully design and deliver automated services. The first step toward the delivery of automated services is to define exactly which services a local government offers to its citizens. Depending on its purpose and the local rules and regulations, the service offering can vary greatly. The city of [Metropolis] is responsible for the distribution and renewal of parking permits for its residents. As a citizen of [Metropolis], I would like to request and renew my parking permits, and submit changes in case I buy a new car. Although both service descriptions are very similar in terms of their actual purpose, there is an important difference. The first description is clearly written from a provider point of view, whereas the second one is user / citizen centric. In service automation, services always need to be actively requested through a technology interface. The second definition clearly outlines the beginning of a workflow that starts with a clear trigger (I would like to request…). The value of defining local government services from a user or citizen point of view, is that this service description clearly outlines the expectations that citizens have. On a more practical note, it is fairly simple to compose a list of all the services a local government should deliver by asking people what services they need to have or would like to request. People know that they would like to request a parking permit, or change their car license number. From their perspective, they don’t mind that a local government sees this as part of their service catalogue as long as their requests are effectively resolved. In step 2, we will build on the example of a local government office that provides parking permit services to its citizens. Many of the services that are requested from local governments fall into some sort of category of similar services. Requesting a new parking permit clearly falls into the category of parking. As does extending an existing license or changing a car license plate. Similarly, other categories can be devised which constitute the ‘main’ activities of local government responsibilities. Each category can therefore be seen as separate service catalogue, which has different rules and permissions assigned to the catalogue. An example of a grouping exercise is depicted in figure 3. Besides the clarity that categorisation brings for citizens (it makes things easy to find), there are some additional benefits in the next phases of service automation. One of the primary benefits is that each catalogue can easily be managed by a different team or department within a local government organization. 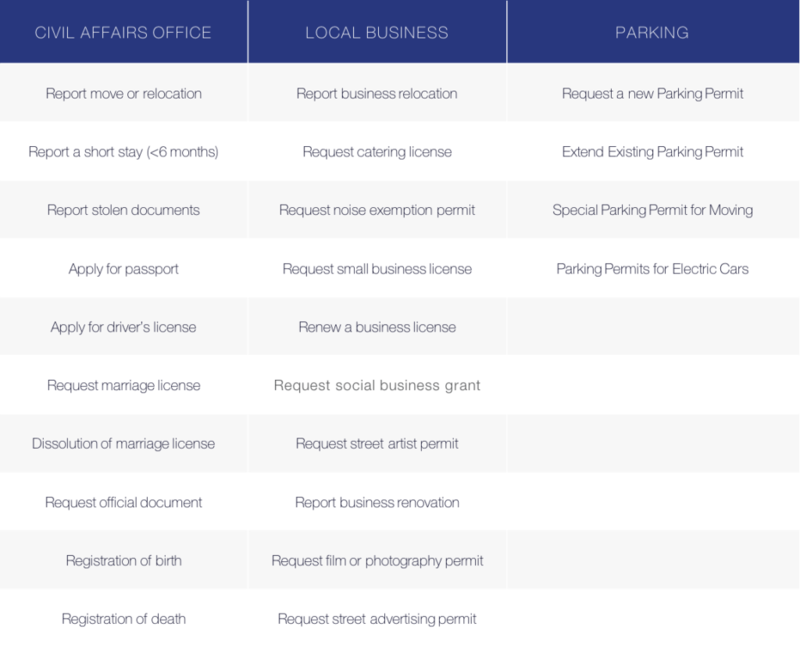 The ‘Parking’ category, for example, can be managed by a local Transportation Authority, whereas the ‘Civil Affairs’ category can be managed by a completely different department. After each service catalogue has been specified, the next step is to compose a Service Automation Blueprint for each individual service. The team responsible for delivering that specific service comes together to create the blueprint. What are the key characteristics of the citizens that use the government service? What are the steps that every citizen takes (or should take) when consuming the service? What kind of information should be provided back to the citizen so that he or she has a positive service experience? What are the underlying processes that are needed to ensure that the service can be executed properly? Who in the organization is responsible for executing, monitoring and improving the service and service delivery process? Although most of these questions sound very simple, the reality is that they are often skipped or not properly defined. Lack of clarity in the blueprinting phase causes poor design choices, which may lead to a suboptimal service and user experience. 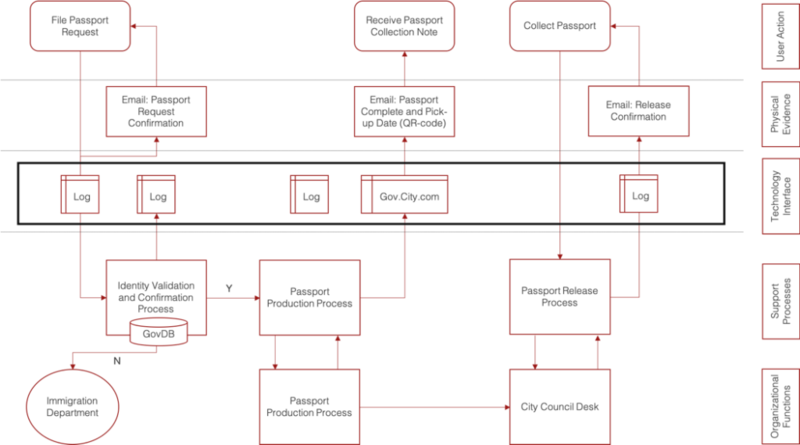 Service Automation Blueprinting is a very structured and easy-to-use visualization tool to capture all aspects of an automated service experience. After each individual service has been designed using the Service Automation Blueprinting approach above, the next step is to translate these blueprints into workflows and scripts that can be embedded in a self-service portal. In the end, the self-service portal is the primary (and only) interface that a citizen has with the local government. If the automated service is designed well and functions properly, all activities will be conducted through this portal. 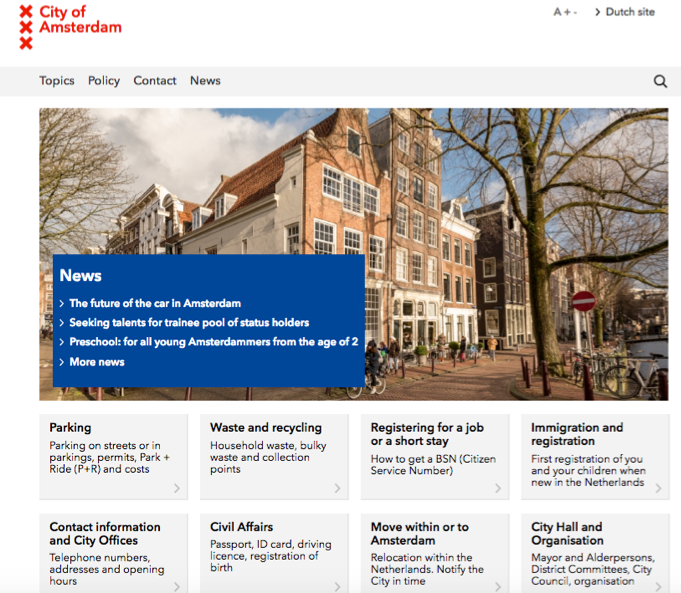 An example of a self-service portal of the city of Amsterdam is depicted in figure 5. After the launch of a newly branded self-service portal, one of the most important criteria for success is that people also start to actively use it. This requires an awareness campaign, advertising or other forms of communication that will make citizens aware about the availability of automated services by the local government. An effective way that we have found in previous service automation implementations is to direct answer machines to the portal, especially after regular office hours. Most people will understand that they cannot walk into a government office on Sunday to request a new passport or parking permit. However, if they are made aware that they can file these types of requests through a local government self-service portal, a large number of people will automatically switch to this option. The last and final benefit of setting up service automation in local governments is that service automation gives organizations the ability to surprise in a positive way. We have labelled this serendipity management: something good that you did not expect beforehand. Because all services that are delivered through the portal can be actively monitored and tracked, local governments can now actively devise ways to make service experiences better for their citizens. You receive a message that your neighbor has requested a parking space next Saturday in your street for moving purposes. You receive live and updated information when your special garbage will be collected. For each of the examples above, ask yourself whether your local government is currently doing this? If the answer is no, it might be that service automation and the Service Automation Framework might work to their benefit as well.